The Ecumenical Chaplaincy Centre is located in the centre of Bath University campus to the right of the library as you face it, just in front of the 3 East building. It is open 24 hours a day 7 days a week during term time and from 9am - 6pm during university holidays. Holy Mass on Sundays at 12.30 is celebrated in the ECC and Father Bill OSM is also available at mutually convenient times for meetings there. 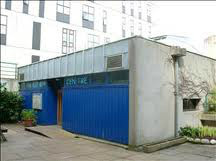 The Catholic Chaplaincy in Bath has its own ‘downtown’ Centre fast becoming the ‘CCC’: In the basement of the Presbytery of St.John the Evangelist Church, South Parade, BA2 4AF (a three minute walk from the city bus station) accessed via stone steps by Parish Hall. There is a video entry phone at the top of the stairs. The Catholic Chaplaincy Centre is a contact place for students from both Universities and other Higher Education Institutes along with other young Catholics of Bath. The centre is open for drop-in sessions at announced times throughout the academic year. In addition, the centre hosts by prior arrangements a variety of activities for Bath Catholic Youth. Freshers' Week has various things happening there and other things are scheduled from time to time by CathSoc and Father Bill. So feel welcome to come to everything and anything and see and if you have any ideas as to how to use the facilities there. Just let Father Bill know. Step 1. Go to South Parade. This is on the right of Manvers St as you follow the 18/418 bus from the bus station; or if you stand with your back to the railway station, walk ahead along the street facing you (Manvers St), past the Police Station and a carpark, South Parade is next on the right. Turn right off South Parade, through the black iron gate. So now go past the big double doors of the church, then the first door which is the Presbytery (see sign by door). Turn left into the next entranceway - which leads to a stone stairway down. The Catholic Chaplaincy Centre (CCC) is down these stairs, at the bottom on the left. There is a video entry phone at the top of the stairs (for if the external door is closed), or at the bottom by the CCC entrance.